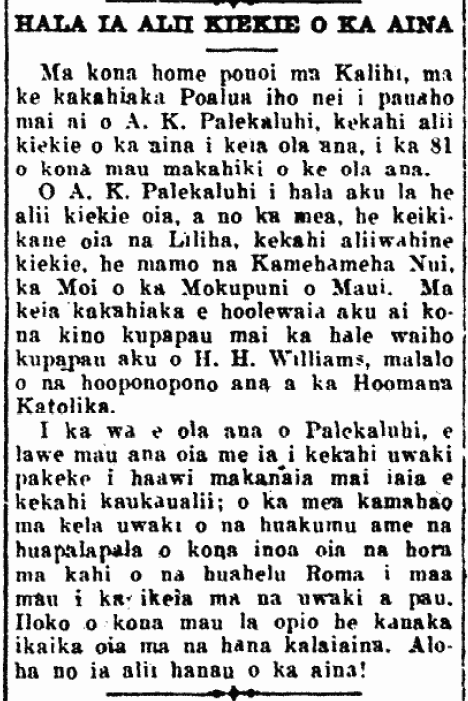 Aberahama Kaikioewa Palekaluhi passes away, 1912. THAT HIGH CHIEF OF THE LAND HAS GONE. At his residence in Kalihi, on this past Tuesday morning, A. K. Palekaluhi, one of the high chiefs of this land grew weary of this life, at 81 years of age. A. K. Palekaluhi, who died, was a high chief, as he was a son of Liliha, a high chiefess, a descendant of Kamehameha Nui, the King of the Island of Maui. On this morning, there will be a funeral over his body from the mortuary of H. H. Williams under the administration of the Catholic faith. While Palekaluhi was living, he always carried with him a pocket watch given to him as a present by a kaukau alii; the amazing thing about that watch was that the initials and letters of his name were the hours in place of the Roman numerals you normally see on all watches. During his youth, he had much power in politics. Greatly loved is that native chief! Ka Nupepa Kuokoa, Buke XLVIII, Helu 22, Aoao 4. Mei 31, 1912.